From September 18 – 20, Seoul will be using whatever available means to instill a peaceful atmosphere throughout the city surrounding the opening of the Inter-Korean Summit in Pyeongyang, North Korea. 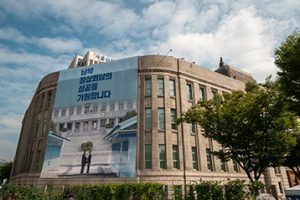 The Seoul Metropolitan Library building will be adorned with a large banner while the 25 district government office buildings are to be decorated, as well, with the Korean Unification Flag. The Seoul Square Media Facade, located adjacent to the Seoullo 7017, will also be displaying video footage capturing the harmonious imagery of the Korean Unification Flag, doves, and the handshaking of figures, in addition to the main stairway of the Sejong Center for the Performing Arts being wrapped in a message that advocates the yearning for a unified Korea. Unification flags are also to be hung along the Sejong-daero and other major thoroughfares. Large LED screens will be set up at the Seoul Plaza, in addition to the south end of Gwanghwamun Square and the Dongdaemun Design Plaza (DDP), so that everyone has a chance to witness, in real time, the historical moments of the summit as it unfolds. The flowerbed located at the south end of the Seoul Plaza will have its flowers and vegetation sculpted in reproduction of the unification flag. Additionally, in front of the statue of Admiral Yi Sun-Shin at Gwanghwamun Square, the much talked about blue footbridge, where President Moon and Chairman Kim joined in conversation with one another at the Panmunjom during the previous Inter-Korean Summit last April, will be recreated as it was on that momentous day. Visitors from around the city will be able to take pictures as they personally identify with the significance of the historical events that had transpired. Seoul is scheduled to operate an international press center at the DDP, amid efforts to promote an ambience of peace on the peninsula, as the citizens gather in hope of a successful, the 3rd Inter-Korean Summit. Seoul resident-centered marketing, participatory programs, and support for international press conferences, are among the main activities that the Seoul City will be operating in promotion of a triumphant summit.